Modern navigation, mapping and surveillance systems require numerous vision sensors to be mounted at random locations over a geographically large area. One of the most important research issues in this field is the problem of selecting a small subset of sensors in the network that will carry out the requested task most efficiently. In this project, we have developed an algorithm to create distributed look-up tables that will rank cameras according to how well they can view a specific location, thus facilitating selection of best cameras. 2. Considerable reduction in network traffic that would otherwise be needed to carry out the process of camera selection. 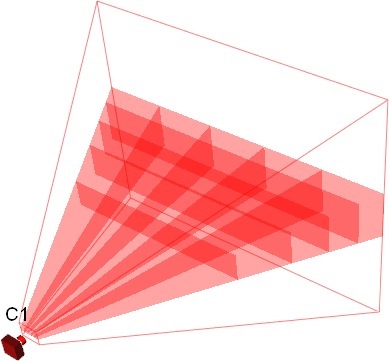 The Figure shows a camera and a single layer of its viewing frustum. 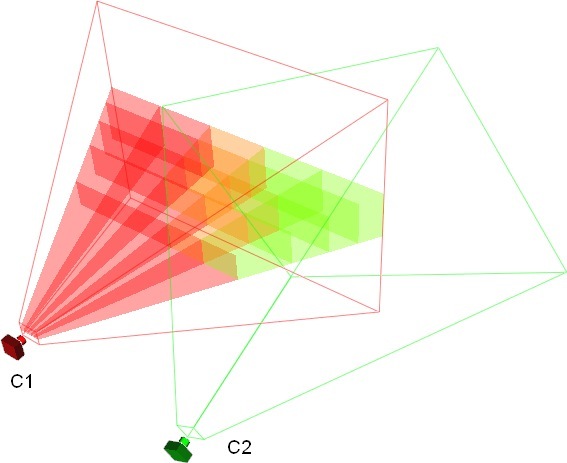 Camera C2 is added to the system and it broadcasts its frustum coordinates to camera C1. Camera C3 is added and the look-up table of camera 1 is updated again. 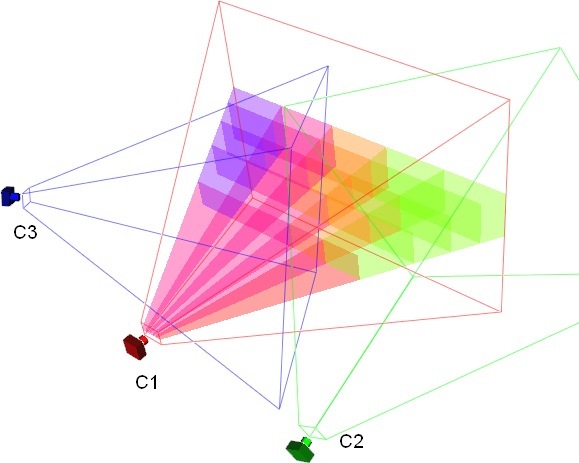 The following simulation shows a network of 20 cameras, each with the distinct color. Color coded look-up tables for three separate cameras are shown. The color of each sub-frustum represents the color of the most favorable camera. All look-up tables consist of 10×10×10 sub-frustums.